When secret sewing takes up a lot of your time, sometimes its good to bust out and work on something random for a while! This weekend I was able to finish an upcoming secret sewing project (hooray) and then spent some time working on putting together the first eight blocks of my Top Spin quilt. I have been making the HSTs for my Top Spin blocks (pattern by Melissa of Happy Quilting on Moda Bake Shop) as a leader and ender project for about eight months. Sometimes I've been better and worse about remembering to use the leader and enders, but I think I've made just about all of the small and medium sized HST units and have started on the pile of squares for the large HST units. I also picked out the fabric to use as the background -- its the same fabric that I used for the backing of my two Pinwheel Pals quilts. I'm planning to make my quilt twin sized. Here are the blocks piled up and laid out before I sewed them. I was able to make eight blocks with the limited number of large HSTs that I have, but it was good to finally get a few blocks made. I will need 48 blocks for a twin sized quilt without a border, so that means I'm already 17% of the way done with my blocks! I have two different large chunks of fabric in my stash that I plan to use for the backing and the binding. If you missed my live stream of my Island Batik box opening, you can watch it any time on the Honey, Bunny, and Doll Facebook page! 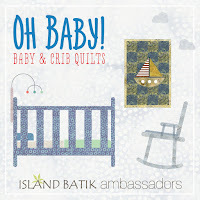 I'll be doing an Island Batik Giveaway on Friday, so don't forget to come back and enter to win! Since my sewing has mainly consisted of working on secret sewing and, well, not sewing, today I have a few fun updates from our Etsy shop! 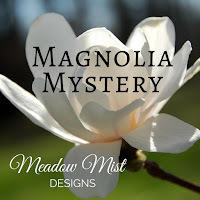 First and foremost, thank you to everyone who has purchased their background fabric for the Magnolia QAL through our shop! We have decided to extend the sale into August so if you still haven't bought background fabric for the QAL yet OR just want to stock up on Kona at an amazing price ($6 a yard!) click on over to our shop. Next, my mom did a little "shop cleaning" and put together some fun bundles to clear out some stock before the fall! 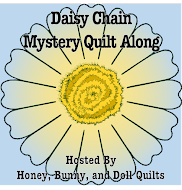 We have a 1.5 inch strip bundle, a 2.5 inch strip bundle, as well as mystery fat quarter bundles! Don't forget that we have kits available for Hip to be Square, Diamond Fire, and Bear Tracks! Our kits include the PDF pattern, so you don't have to buy it separately! Finally, we now carry three of our most popular patterns in hard copy! Starlight, Bear Tracks, and Ready, Set, Soar! are currently available as print versions that will be mailed to your home. As always, we love our supporters! If you have questions about our patterns, shop offerings, or really anything quilting, do not hesitate to email us or leave a comment here on the blog! It's hard to believe that this is the last quilt that I will work on for this bee and that I will get my quilt back soon! This month I was working on a quilt for Audrey of Hot Pink Quilts. She's the one who actually organized our little bee and she has been one of my BBF (best blogging friends) since probably 2012! 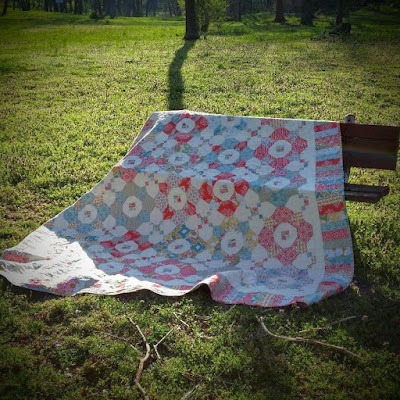 At the last stop, Susan added the snail tail and New York beauty border around the quilt top. The top measures 62.5 inches long and 64.5 inches wide. Instead of adding a full border around the entire quilt, I decided that I would add a wider strip at the top and the bottom of the quilt so that it would be approximately twin size when it gets back to Audrey. After shorting through all of my fabrics that fit Audrey's color scheme, I started by cutting all of the pieces for my 12" blocks. 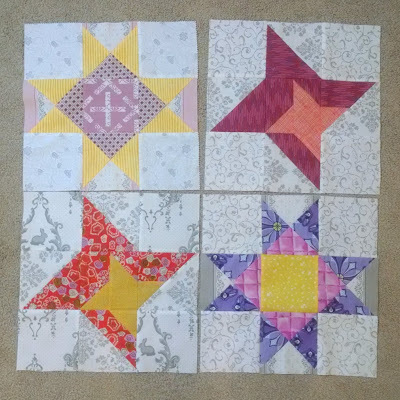 I first made the two Ohio star blocks and two Nested Friendship stars. Then came the two Martha Washington Stars and the two Missouri Stars. Next came eight 6" sawtooth stars. And drumroll please, the entire quilt ready to be sent back to Audrey! Have a wonderful Wednesday! Sharing at Let's Bee Social, Needle and Thread Thursday, and Finished or not Friday! When I finished my sapphire block last week for my Birthstone quilt, I still had the itch to do more paper piecing, so I decided to go ahead and pull the fabrics for my tanzanite block and work on that this month as well. Tanzanites, at least those that are most valuable, are indigo in color. I pulled some blue-hued purples and some navy blues for this block. Now I have nine of my twelve birthstone blocks done. The three remaining blocks are my January garnet, my July ruby, and my October opal. I will likely try to work on my two red blocks first -- garnet will be a dark true red block and the ruby will be a pinky red block. In my mind, I would like to make my opal entirely from pastel shades of Fairy Frost, but I think that the most of my Fairy Frost scraps have been depleted. For those interested, this pattern is from No Hats in the House. Happy Monday to you! I have spent most of my weekend doing the quilting for my upcoming Moda Bake Shop project that will be published in about two weeks! Sharing at Monday Making, Main Crush Monday, and Linky Tuesday! Another month with more houses added to my subdivision! I had originally cut out the pieces and parts for three blue houses, but then realized that I had already used on of the fabrics to make a house block when I first started making these blocks. I decided to just make two blocks this month instead, and I'll make another blue one if I end up needing an extra block or two. Since we're more than halfway through the RSC for 2017, here are all of my house blocks together. There are 32 blocks so far, 10 of which I made prior to this year, the remaining 22 I have made this year. If I make 42 or 48 blocks, I would have a twin sized quilt without any sashing or borders. We still have the following colors yet to do for the Rainbow Scrap Challenge: orange, pink, black/brown, and whites/creams/tans. This quilt is finished and ready to snuggle! My finished baby sized version of our Spring Splendor pattern was a quick and easy quilt! The quilting was quick and easy -- I chose to do an all over loopy meander. Not terribly exciting or involved, but perfect for a baby quilt. I used blue flannel for the backing to make it extra cuddly. The binding is the bright blue print. I learned a hard lesson a few years back when I bound a flannel-backed quilt with a flannel binding and will never, ever do that again! Now this quilt will sit and wait until it is called into service! Like many of you, my sister Amanda is doing the block of the week associated with the Quilter's Planner this year. She has lots of neat blocks that she has made and she has made a few that she wanted to turn into mini quilts instead of being part of a larger quilt. 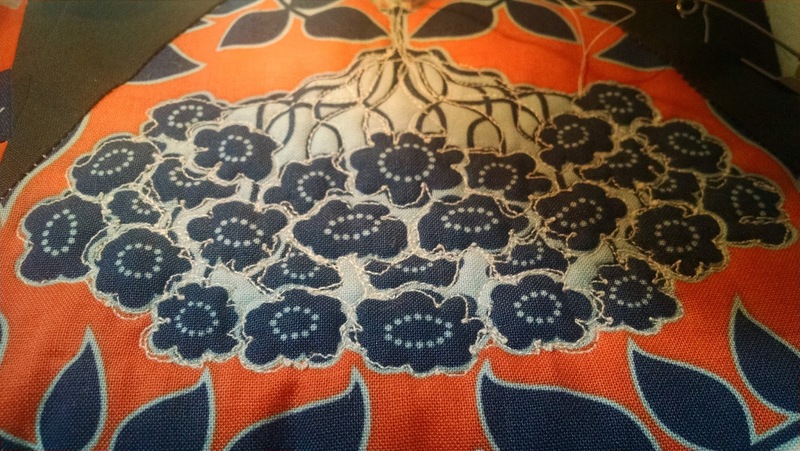 In the white sections of the lady-suit I quilted loops, and then the man's suit is quilted with orange thread in a meander. It's not often that you have a reason to use orange thread and the thread matched the orange solid perfectly so I basically was obligated to use it! The backing that I used was an additional fat quarter of lady-suit print my sister gave me to use. I also used it for the binding. A fun quick project to distract me from all of the things on my WIP list! Have a happy Monday, and don't forget to stock up on Kona while our sale continues! 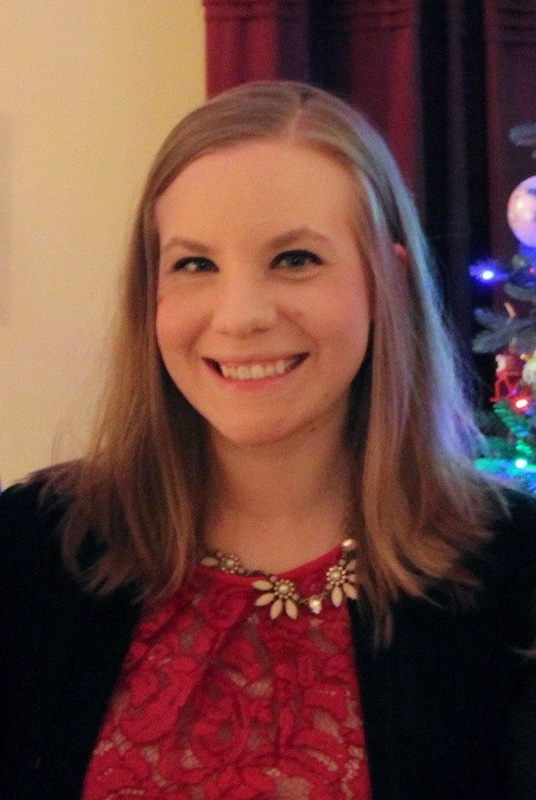 Sharing at Linky Tuesday, Let's Bee Social, and Needle and Thread Thursday! While I might not be drowning in scraps, sometimes it feels like I am drowning in scrappy projects! As you know from my monthly "Brutally Honest" posts, I have quite a few. I've made quite a bit of progress lately on a few of them and rounded them all up for one post. 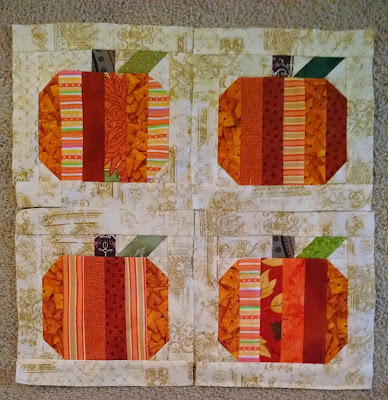 For July, my mom was the Queen Bee and she requested scrappy pumpkin blocks. I made her four blocks and used up a lot of orange scrap, including the majority of a piece of novelty cheese-it print fabric I got in a scrap bag purchased nearly 7 years ago. And as you might have seen on Instagram, I've been working on my Coast to Coast Bee blocks for Audrey! 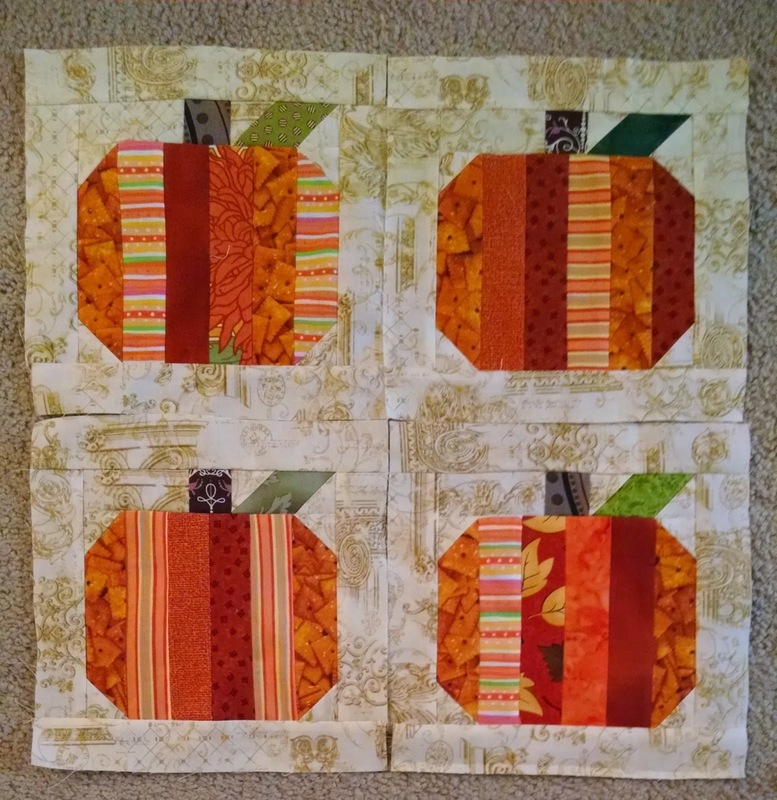 I will be doing a full post once I am finished with my addition to her quilt, but I have been able to use all scraps and stash for my blocks! I have also finally made my scrappy sapphire to add to my birthstone collection. I now have eight of the twelve birthstones done -- the ones that are remaining are the garnet, ruby, opal, and tanzanite blocks. This is counts as progress for the Rainbow Scrap Challenge since our color for July is blue! Have a happy weekend! I'm hoping to make some more scrappy project soon! PS. Don't forget to check out our summer Kona special! The two sizes are the yardages needed for the Magnolia QAL, but it's always a good time to stock up on Kona, right? As you can see in these blocks, I used four different blue and green fabrics for my "lozenge" pieces, an orange/gold for the accent color, and then the four patches within each block match. In the original Spring Splendor Quilt, all of her four patches were scrappy, rather than matching within the same block. Just a fun way to change up a pattern and give it your own twist! As I noted in my previous post, I decided to make the pieced border 4.5 inches wide rather than 6.5 inches wide as in the original pattern. Part of this was a scaling decision -- smaller quilt, smaller border. Part of this was making sure that the quilt was small enough to back with a single width of fabric -- this top is 40 inches square. I'm planning to back this with blue flannel (so many snuggles!) and bind with the royal blue fish fabric, since I still have lots of it! Don't forget our Kona special is still going strong! Sharing at Let's Bee Social, Needle and Thread Thursday, and WIPs with Friends! This quilt was a very long term WIP -- started in 2014 as part of my QCQAL -- the top was finally constructed in 2015, and I finally have it quilted and finished! Hooray! Most of the blocks used in this quilt were featured as tutorials on my blog in Summer 2014. Many of the other blocks have easy to find tutorials and patterns in other places. I talked a little about starting to quilt this quilt here, and wanted to add a few more notes in this finish post. The further I moved out from the center, the easier and easier quilting this quilt became. It is about 70 inches square -- so a rather large throw -- so working on the center blocks was rather difficult. Finally getting to the edges was cause for celebration! I didn't count the rings or sew my spirals to a particular width or size -- I mostly just kept continuing the spiral until it filled in the "nooks" left by my previous spirals. The spirals don't equally overlap because the blocks are not perfectly arrayed in the quilt. I also had to add in a few "tiny spirals" along the edges to fill in some open spaces as well. I ordered the backing and then got the dreaded email stating that I was getting the last of the fabric in stock -- but it was in two pieces. I realized after getting it that had it been in one piece, it would have actually not been big enough for the quilt! So I added in a half yard of Summersault fabric so that it ended up being the correct size. I also made sure all of my diagonal stripes went in the same direction. For the binding, I had just enough of my white backing fabric! It has a different sort of look having a lighter binding with a slightly darker quilt. I sewed the binding by machine to the front and hand stitched it to the backing. This is going to be my new summer couch quilt! 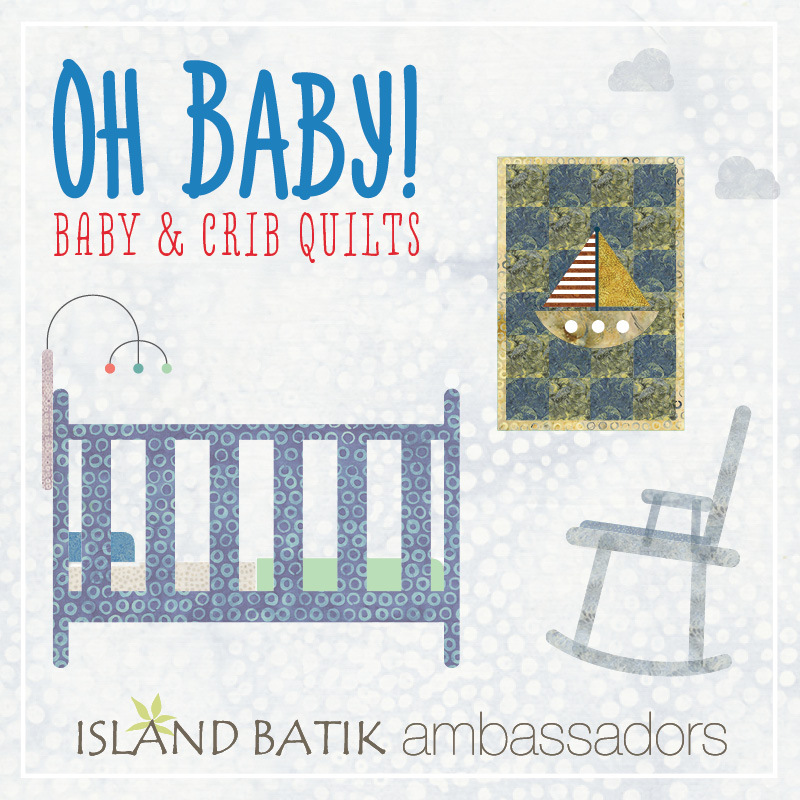 Our July Island Batik Ambassador theme is baby quilts! I am at a time in my life where I make and give away a lot of baby quilts to family and friends, so this is my kind of theme. One of the things I've also been working on behind the scenes is reworking some of our original Honey, Bunny, and Doll patterns with alternative sizes. This month I'll be working on a baby sized version of Spring Splendor which will be added to the current pattern! The original version of this quilt, made by my sister, is a queen sized quilt made from a fat quarter bundle. For my baby sized version I had two options that would put me in the right size range: a nine block quilt without the piano key border, or a four block quilt with a piano key border. I decided to go with a four block quilt with a piano key border making blocks the same size as the original pattern. I pulled out my Lake Life fabrics and started cutting. I went through and cut the main fabrics for one block at a time and put all of the parts into a zipper bag. Since I had already used quite a bit of the layer cake (pictured below when I first got my Island Batik goody box! ), I mainly had yellows, oranges, and blues left. Next, I cut the strips for the four patches and sewed those together. Each block has one 4-color four patch and four 2 color/2 background four patches. I also cut the piano key border pieces once all of my block pieces were cut. I decided to go with a 4.5 inch wide border instead of a 6.5 inch wide border. Now I am ready to start sewing the blocks together! This should be a relatively quick project from this point forward since everything is cut and ready to sew! These blocks have quite a few stitch and flip units, so those will take some time, but with only four blocks to make, it should be easy peasy to get this finished this month! If you're interested in a color that we don't currently have listed as part of the bundle special, send us a message on Etsy and we can see what we can do!